U2 has always been a band that creates discussion, whether you like them or not. If you haven’t already heard, U2 is releasing their eleventh studio album, No Line on the Horizon, on March 3rd. 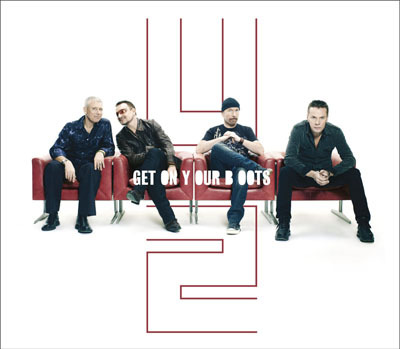 The eclectic first single, just released, is entitled Get On Your Boots. The album is rumoured to showcase some substantial changes to the band’s sound, similar to what Achtung Baby did for them in the early 1990s. Follow this link to their webpage, where you can listen to the song (it might take a minute for the song to load). Then tell me what you think. Is this song a step in the right direction, affirming U2’s status as the cutting-edge and perennially relevant “world’s band”? Or does this single serve as further proof that U2 is now worn out, washed-up and out of touch with both the world’s circumstances and the current popular music scene? On a broader level, is the band an important representative for Christ’s love and hope as they call the world to task on such important causes as global poverty, peacemaking, and AIDS? Or is all that charity work merely a thin veneer hiding just another group of selfish postmodern rockers intent on making the big bucks? Feel free to weigh in with your (respectful) opinion. I’ve never been a diehard U2 fan, so I can’t say I’m totally informed regarding their music and global initiatives. U2 has produced some of my favourite songs; songs that, I think, cross church/culture boundaries by speaking truths about the universality of the human condition. However, I have often wondered how they fit into the prayer of Christ that his followers be “in the world but not of it” (Jn 17:15-16). They are better than than bulk of Christians at fulfilling the first half of Christ’s prayer; how exactly does one fulfill the second half without blurring the lines? And does U2 blur the lines?Like I said, I’m not a “U2 expert” so I could be way off. These are just some questions that’ve floated through my head. I totally respect all of their work to raise awareness regarding the AIDS epidemic and global poverty. It’s a challenge to Christians to be similarly engaged with our society.